I have a guilty secret. I love cardiac arrests. Yep, I said it. As a brand new doctor, there was something exciting about dashing off to a 2222 call, even if my main contribution was scribing or occasionally getting IV access. This was the medicine I had seen on TV! Even now, as a (slightly) older, and (much) more cynical, ED doctor, I still feel that excitement. I see my fair share of cardiac arrests, usually (but not always! ), brought in from the out of hospital setting. Yes, I know the outcome data (dismal). and the almost total lack of evidence for a lot of the theatre surrounding ALS (“give the adrenaline” I say, with a shrug…), but still, I get a lot of satisfaction from a well run resuscitation with a team running like clockwork. Of course, the pay off can be great: every so often, we bring someone ‘back to life’. How totally flippin’ awesome is that? The other reason I love cardiac arrests is the amount of gadgetry I get to play with. Airways, ventilator, defib, ultrasound… awesome! (although I have to actively stop myself having a ‘quick look ‘ with the echo probe during rhythm checks… my echo skills are amateurish to say the least). But of all these toys there is one I have really found makes a difference to the ‘traditional’ ALS I had been taught: capnography. For the uninitiated – a capnograph detects the amount of CO2 in the air flowing past the sensor. It is usually attached to the top of the ET tube or LMA. The vast majority of our OOHCA patients are now delivered with capnography in place. This is because, at least where I work, the ambulance service was way ahead of many ED’s in this regard. This was mostly in response to NAP4 – the national airway audit of the RCOA. There is a great summary here. One of the issues highlighted is that many airway disasters could be prevented by the use of capnography in the ED/ICU setting. Now the paramedics here have been intubating cardiac arrests for years, and they quickly took this on board, and these patients started arriving with quantitative ETCO2 attached. They were a little ahead of the ED’s on this, and I still see colleagues disregarding what I think is a really useful source of information. Firstly, and most obviously, it gives us a degree of confidence in the placement of any airway. This is what NAP4 was talking about. 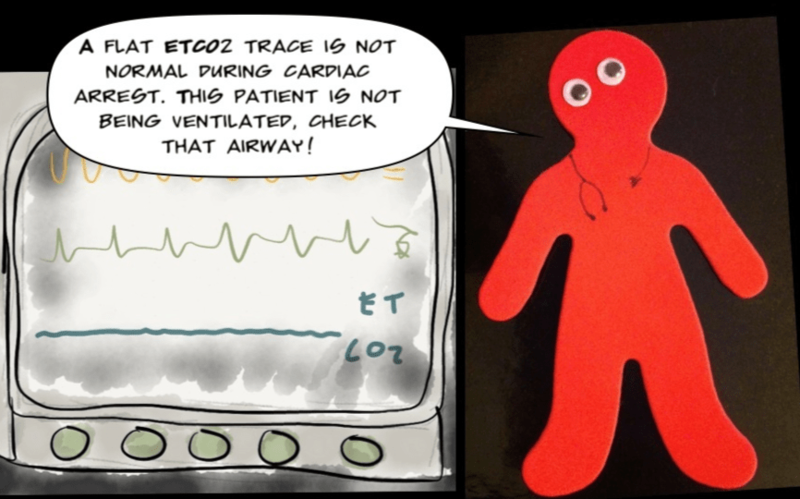 A good ETCO2 trace means you can be confident a ET tube is in the right place (but it’s not completely fool proof – I always like to have a listen as well). I find this most reassuring when dealing with a pre-hospitally placed ET tube. Our paramedics are highly skilled people, but my OCD means I am not entirely happy dealing with a tube I have not seen go through cords myself; capnography goes some way to reassure me. There is more information to be gleaned from that neat little waveform on the screen than just your airway placement. There is a suggestion that ETCO2 can help guide the quality of the CPR, help in prognostication during resuscitation and even help us diagnostically with our 4H’s and T’s. These ideas are not new; this was being discussed in medical literature published before I was born. The idea is that ETCO2 can be used as a surrogate marker for perfusion generated by cardiac compressions (apologies, physiology will be kept to a minimum).Once cardiac arrest occurs, CO2 rapidly builds up in the tissues (both due to ongoing aerobic respiration and buffering of excess H+ produced in anaerobic respiration). At the same time, this CO2 is not being removed by the circulation. Once cardiac compressions commence, some (up to 25%) of cardiac output is restored and this truck load of CO2 starts to make its way to the lungs, where starts to get removed via ventilation. It is this CO2 we can detect with the capnograph. The ETC02 is falling! Are you tired? Now, if we believe that ETCO2 correlates with perfusion, we can start to imagine its usefulness. The whole idea of cardiac compressions is to provide perfusion and therefore oxygenation, to the tissues. If you are getting good perfusion, then you can theorise that the ETC02 will go up. The exact numbers are up for debate, but anything over 1.3kPa (10mmHg) can be considered reasonable, and if it drops below that then it is worth trying to optimise your cardiac compressions (swap put a tired provider, check rate/depth etc. ). Of course, as it’s probably the most important part of the whole rigmarole, we should be watching the quality of compressions at all times, but it’s good to have a bit more information to help us. The ETCO2 has jumped up…. time for a rhythm check? If we believe that ETCO2 correlates with tissue perfusion, then another potential use of this monitor becomes apparent. Imagine, during CPR, the ETCO2 suddenly jumps up, say from 1.8kPa to 3.8kPa. This suggests a sudden improvement in tissue perfusion and may represent a return of spontaneous circulation. You may want to consider a rhythm check, even if this occurs mid-cycle. A word of caution here. You don’t want to be stopping and starting CPR at the drop of a hat. Cardiac compressions are one of the most important parts of ALS, and frequent stoppages worsen outcomes for your patient. If you are comfortable with reading the ETCO2, and there is no other reason for the increase in the value (e.g. new provider takes over compressions from a tired colleague) then it may be worth a check. If you’re in doubt, keep on going until the end of the cycle. The ETCO2 is good…. should we keep going? The logical continuation is that as long as ETCO2 is at a reasonable level, then this suggests that organ perfusion (and importantly cerebral perfusion), is also reasonable. Does this indicate a good prognosis, and mean we should continue CPR? This paper from NEJM, and this one from Critical Care both suggest ETCO2 levels at 20min are significantly better in those who go one to achieve ROSC than those that don’t. I would certainly want to continue resuscitation if the ETCO2 values remain at a normal or near normal level during CPR (the average value in patients with ROSC in those two studies was around 4.2kPa). The ETCO2 is still low…. should we stop? There is a further step to take. If a good level of ETCO2 indicates good perfusion, then a low level may indicate poor perfusion. If there is a prolonged period of poor perfusion, does this indicate a poor prognosis? Can we use a persistently low ETCO2 to help us make a decision to stop CPR? Both of the papers I mention above were designed to help with the decision to stop. In both papers, no patients (out of 887) achived ROSC if they had a low ETCO2 (<1.3kPa for the NEJM paper, <1.9kPa for the Critical Care one) at 20min. While I don’t think one single factor can make this difficult decision for us (see the next paragraph); this would certainly give me more confidence in my decision to cease resuscitation. OK, 4 H’s and T’s…. 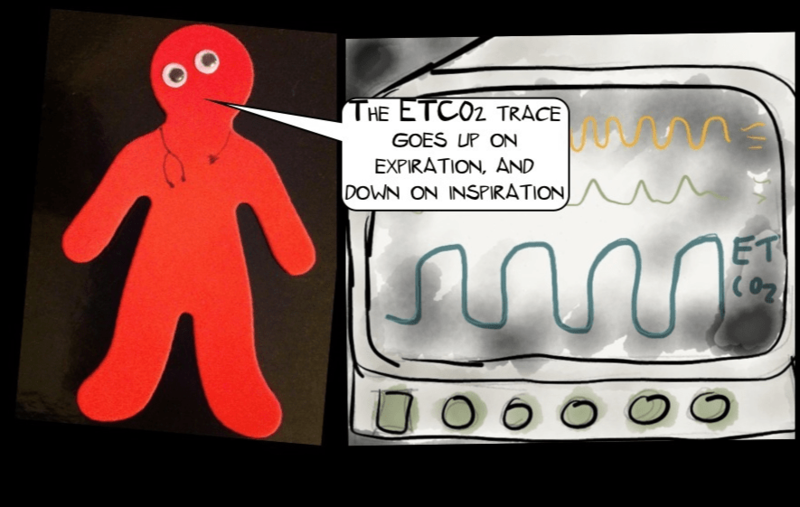 What’s the ETCO2? We’re straying a little out of my comfort zone here, but it has been suggested that the ETCO2 value can help us diagnose the cause of a cardiac arrest. Think this through logically. We’re early on in an arrest, ALS is ongoing, good quality chest compressions, great…. but the ETCO2 remains really low. We’re doing everything we can to get oxygen to the tissues, but the CO2 isn’t getting to the lungs…. almost as if something was blocking the blood returning to the alveoli. Conceptually it makes sense, a big PE would mean that ETCO2 levels are lower than you would expect. This is suggested by this recent paper in Resuscitation. While interesting, I’m not sure I would be thrombolysing during an arrest based on the ETCO2 alone. This idea may give us pause when interpreting a very low value though. 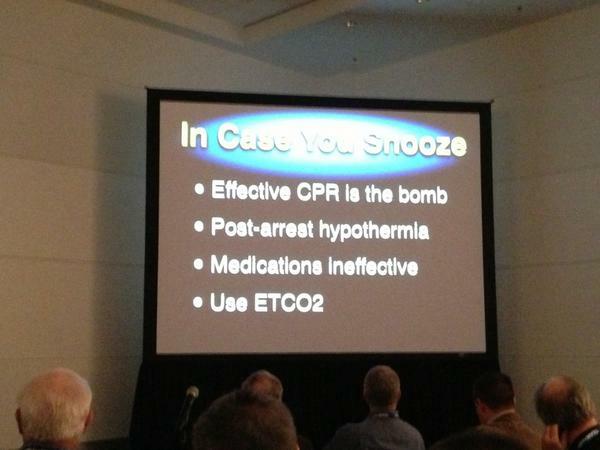 For the reasons I have discussed, I think ETCO2 is a useful tool to have in a cardiac arrest. But like all the tools and information we use, it can’t be considered in isolation. Inevitably, the physiology is way, way more complicated than I can explain, and so we can’t interpret the number on our screen in a simplistic way. The Resuscitation article linked to above was discussed on the excellent SCANCRIT.com, and they lay out the potential limitations nicely. They point out that the value we see on the screen is influenced by several factors, including the cause and duration of arrest, and the presenting rhythm. Medications given in cardiac arrest can affect the reading you see on the ETCO2. Adrenaline can reduce the value (interesting if this reflects reduced perfusion…) while giving bicarbonate can increase the value. All of these issues must all be considered when making decisions based on the ETCO2 reading in front of you… Nothing is ever simple in this job. Enough waffle… what should I do? Most patients arrive with the capnography attached. I swap the capnograph over to our monitor when I put the patient on the vent or on my BVM. A quick look confirms the trace, a listen to the chest/check for fogging as well to make sure the airway is patent. If there is no trace: CHECK THAT AIRWAY. If in doubt, take it out. If the value is very low (roughly <1.3kPa) I will see what can be done to optimise our compressions. Does a tired provider need replacing? If the value is OK (roughly >1.9kPa) then I will tend to continue ALS. I will feed this back to the team so they know why I am making this decision, and to provide positive feedback to the person doing compressions. I will stop for a rhythm check if I see a sudden increase in the ETCO2 that I cannot otherwise explain. This is the practice point that frequently draws comment (as it deviates significantly from traditional ALS), so it may be worth discussing this beforehand if there is time. While I do not make decisions to stop CPR based on the ETCO2 alone, if I am considering it, then a persistently low value would give me more confidence that stopping is the right thing to do. Do I expect you to take my word for all this? No, there are far cleverer people recommending the same thing. Capnography is starting to filter through into the various resuscitation guidance out there. It’s mentioned in the UK Resuscitation Council guidance for adult ALS (page 59), and in the US guidance from the AHA. Excellent Gareth, loads of tweets about this. I’m recommending it to our med students who were asking about this recently. Your explanation much better than mine!! Gareth- Nicely done post! I’ve also made a Capnography post (taken from my ACLS Pocket Brain book). Nicely put My students should really look at this.